Paxton Access Control Systems are a way to automate perimeter security on your premises, so that you do not need to have security personnel at entry and exit points around the clock. 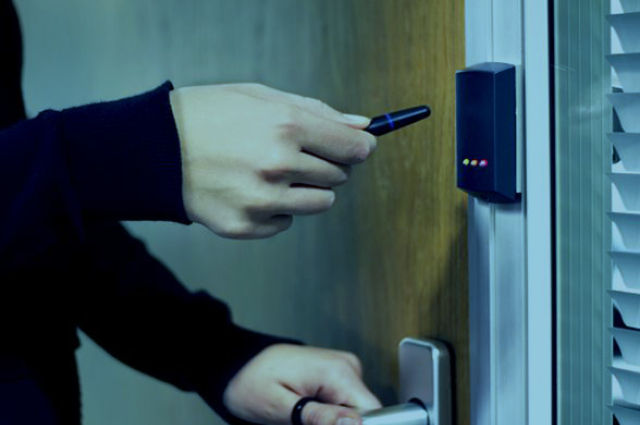 With Paxton Access Control Systems, you simply provide each authorised individual with a Proximity card or key fob, which allows them to open doors that are locked using the Paxton Net2 system. It’s completely customisable, and the cards provided are visually blank, allowing you to print your own branding on them if you wish – you can even have guest passes that can be temporarily authorised when required, and easily deactivate old cards or key fobs if they are lost or if an ex-employee fails to return theirs. This alone adds up to a versatile, highly secure and professional solution to access security, but there are business benefits that go beyond that, including significant cost savings. How does Access Control save money? We’ve already mentioned the cost of having manned perimeter security, compared with locked doors that authorised individuals can open when they need to. There’s no need for specific ‘keyholder’ staff to be the first on site in the morning, or the last to leave – ideal if members of your workforce sometimes work overtime at unusual hours. And if you pay employees on flexitime, or number of billable hours worked, you have extra proof of exactly when they were on-site, and when they weren’t. On top of the cost savings, there are safety benefits from installing Paxton Access Control Systems, as no member of staff needs to be left ‘trapped’ inside the building after-hours, or outside if they are the first to arrive in the early morning. There is also the obvious benefit of keeping unauthorised individuals outside by having doors that are locked at all times, even during working hours, and again this means you are not relying on a security guard to prevent intruders from getting into your premises. It is no longer science fiction to have building services such as heating, lighting, air conditioning and cooling, that only switch on when the premises are occupied. Motion sensors are already present in most workplaces as part of intruder alarm systems, and access control systems provide a further way to detect when someone is entering the building. Together, these systems provide a semi-automated way to activate the building’s various services and facilities, and crucially to deactivate them when the last person leaves for the night, so energy is not wasted powering those systems overnight when they are not needed. To learn more about the benefits of Paxton Access Control Systems for all types of businesses, or to ask us about how access control can help you to meet your industry’s specific regulatory and compliance commitments, contact ACC Security today. It is fastest and easiest to call us on 0161 883 2502 or complete the enquiry form on our Contact page for a direct and quick response via telephone or email. We’re also on Facebook, Twitter, Google+ and LinkedIn, so you can add us on your preferred social media platform and keep up to date with all of our latest news.